Social studies and dance focus on the nature of human expression throughout history and in different cultures. Because dance universally expresses social, historical, cultural, and familial contexts, traditional dances naturally reveal insights into the people who made them. 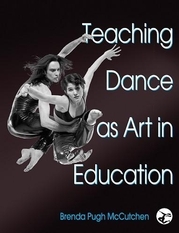 Teaching Dance as Art in Education fosters an understanding of dance as arts education and defines the dance specialist’s roles and responsibilities, including how the national arts initiatives and student-centered inquiry affect the teaching of dance. It explains how to advance student growth in the areas most critical to teaching dance: the physical, mental, artistic, and social. Reflect and Respond: Case studies, or scenarios, invite the reader to consider an issue or situation and develop a response. Questions to Ponder: Thought-provoking questions at the end of each chapter help readers extend and apply chapter concepts. Rich Resources: Suggested resources, such as books, videos, and Web sites, supplement the topics covered in the chapter. Notebook or Portfolio: Practical exercises to complete, record, and compile into an arts-oriented teaching portfolio are useful for future job interviews. Inspirational Quotes: Selected quotes from famous dancers, choreographers, and teachers support the topics covered.